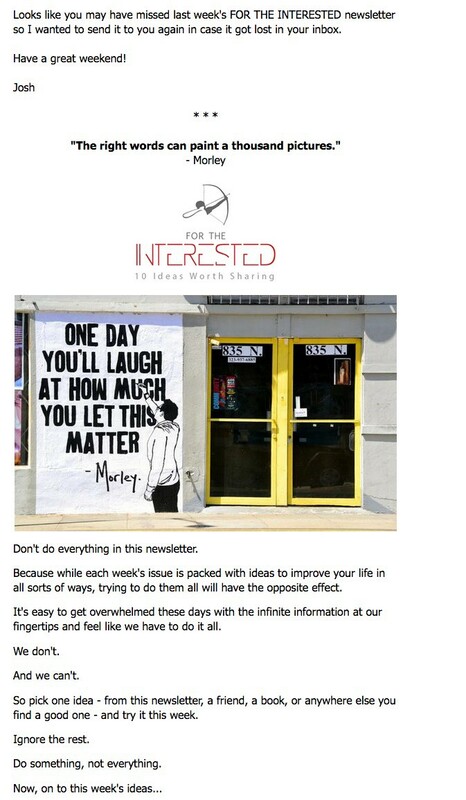 A behind-the-scenes look at the For The Interested newsletter. I’m not big on secrets. Because the more secrets you keep from your audience, the less value you deliver to them. I prefer to share exactly how I do what I do in the hopes it can help you. With that in mind, here are the five tactics most responsible for attracting 18,000 subscribers to my For The Interested newsletter. 1. I produce a quality newsletter, release it with consistency, and design it for a specific audience. It all starts here. This is also where most people fail. While doing these things may seem obvious, most people don’t do them and then get frustrated when they don’t get the results they desire. QUALITY: I put in the time each week (several hours) to ensure my For The Interested newsletter is as high quality as it can be. CONSISTENCY: I’ve published a new issue every Sunday morning for 96 of the last 97 weeks — only skipping the week I got married. My subscribers can count on me delivering what I promised, and can incorporate reading it into their own habits because of this consistency. AUDIENCE: For The Interested features actionable ideas for people who want to improve their work, art, or life and lives up to its promise. It doesn’t feature the news of the day one week, a funny cat video the next, and a personal rant the week after that. It’s for somebody, not everybody. Checking these three boxes — quality, consistency, and specific audience — may not seem like much of a “tactic,” but it’s most definitely a prerequisite. If you don’t check these boxes, none of the other tactics will work for you. 2. I send a weekly “Here’s what you missed…” follow-up email. Your newsletter can only grow if your subscribers actually read it. That’s why the number of people who open my newsletter is way more important to me than the raw number of subscribers. The best thing I’ve done to increase my open rate is to re-send each week’s newsletter to people who didn’t open the first blast within a few days of receiving it. That secondary version contains the same newsletter, but with a brief intro paragraph added to explain I’m re-sending it in case it got lost in their inbox. These follow-up emails to people who didn’t open the initial blast leads to about 25% more people reading each week’s newsletter. It’s also worth mentioning I’ve received a total of less than five complaints over the years from people about getting the follow-up emails (NOTE: I only send follow-ups to people who didn’t open the first one so I’m not doubling up and pestering people who already opened it). Not only that, I often get thanked by readers who missed the email and appreciate the reminder. Plus, if people aren’t regularly opening the newsletter and decide to unsubscribe, that’s ultimately a good thing too — I don’t need to pay to have people on my mailing list who aren’t actually interested in getting my newsletter. 3. I run Facebook ads to attract new subscribers, but the ads promote specific content instead of the newsletter itself. Facebook ads are powerful…if you use them correctly. I experiment with all sorts of Facebook ads to attract new subscribers and find the best ads to drive subscribers are not what most people think. Rather than running ads that specifically ask people to subscribe to the newsletter, I’ve had the most success running ads that promote a specific piece of content that’s indicative of what they might find IN the newsletter. For example, this post about writing tips to improve your writing forever has generated a ton of new subscribers to my newsletter. What happens is the Facebook ads drive people to the post, they find it valuable, and then subscribe to the newsletter using the sign-up form at the bottom of the post to get more similar ideas in the future. Obviously it takes some budget to run Facebook ads (though you can get results for as little as a couple dollars a day), but to give you an idea of return on investment— I’ve gotten subscribers for as little as 40 cents per subscriber and typically average around $1 per subscriber. However, that number only reflects the people who specifically subscribe after clicking on a Facebook ad — it doesn’t account for all the other people who my have subscribed because they discovered the post when the original people spread the word about it or the newsletter itself. This means my actual effective cost per subscriber is significantly less. While the initial ads I ran to that writing tips post converted well, there was one tweak I made after it was running for a while that drastically improved my results. After a couple hundred people had subscribed to my newsletter from that page, I used those subscribers to create a Lookalike Audience in Facebook and targeted that Lookalike Audience. If you’re not familiar with Facebook ads, this means I had Facebook use its data and algorithms to create an audience of people who were similar to the ones who actually subscribed to my newsletter after reading my writing tips post and targeted them with my ads. Doing this instantly cut my cost-per-subscriber in half. Needless to say, once you’ve got enough conversions to create a Lookalike Audience, you’re going to want to try that. 4. I post my newsletter on Medium as well. Each week’s newsletter currently lives in three places — the inboxes of my subscribers, my For The Interested website, and on my Medium publication. I post it on Medium because it allows me to reach a new audience (for free) and attract new subscribers. I’ve done this since the beginning and it’s been a huge driver of subscriptions for me because each week’s issue on Medium tends to get recommended and shared by people on the platform. Using strategically relevant (and popular) tags on Medium such as Self Improvement, Life Lessons, and Creativity, ensures I reach people on the platform likely to be interested in my newsletter — even if they don’t currently follow me. Not only has this been effective to grow my subscriber list, but it also helped me build a large following on Medium itself, where I now have more than 25,000 followers. 5. I cross promote my newsletter with other newsletter creators. One of the best ways to build an audience (besides reading my Ultimate Guide To Growing Your Audience) is to cross-promote your work with others who are building their own audiences. I’ve promoted other newsletters I enjoy (and, most importantly are relevant to my audience) in multiple ways including to reference them in my newsletter and highlight them in a post about 25 newsletters that inspire, educate, and entertain. I even created a Facebook group for Newsletter Creators to build relationships in the space and swap tips. The promotion I’ve given other newsletter creators has led many of them to return the favor and promote my newsletter to their audiences, which has been a great way to get free exposure and attract new subscribers. If you’ve got a newsletter and have any questions about how to attract more subscribers to it, I’d be happy to give you a some advice — just email me.